What is the average price for Used Volkswagen Passat? How many are for sale and priced below market? What Volkswagen Passat model year and mileage can you get for your budget? What Is The Average Price Of A Used Volkswagen Passat By Model Year? What Is The Average Price Of Competitor Cars To The Used Volkswagen Passat? What Is The Average Price Of Used Volkswagen Passat In The Top 10 Cities? In the competitive midsize sedan segment, the 2017 Volkswagen Passat seems to be the quiet wallflower, often overlooked because of its unassuming style. But asking this sedan to dance might make some buyers wonder why they don't go to the VW slot on dealership row more often. The 2017 Passat carries a simple style on its exterior and a lot of goodness on its interior, both hidden in decidedly bling-less attire. Flashy is not the VW way, but if the best sellers in the midsize segment have taught us anything, it's that pretty doesn't always sell in this market. What the Passat has is a full coverage of the basics. The boxes for most midsize sedan buyers include a roomy interior, a good highway ride, smart (and achievable) fuel economy and quality workmanship. The VW Passat ticks off these boxes, though it doesn't lead the pack in any of them. What's most compelling is how these things are mixed and presented. New for 2017 is the discontinuation of the SEL trim and a subsequent shuffling of content as a result. This adds value to the mid-level trims and the SEL Premium (which remains). There is otherwise no other change to be found between the 2016 model year's refresh and the 2017 Passat. The Volkswagen Passat has always been an odd duck in the midsize sedan class. Compared to other sedans, the Passat was slightly smaller and more expensive. But it stood out with a striking design, sharp driving dynamics, and a Germanic quality that few sedans in the class could match. The Passat sedan and wagon never really sold in great numbers in the U.S., but it did have a loyal following. But when 2012 rolled around, Volkswagen made a change that would upset their fans. Volkswagen wanted a bigger slice of midsize sedan market and decided it was time to build a Passat specifically for the U.S. The new Passat was bigger and featured a softer ride. It was also cheaper than the outgoing model, thanks to Volkswagen making some very questionable decisions in terms of materials and engines. While fans decried this decision, the changes appeared to be working. In the first two years, the Passat became a strong seller for the brand. But after that, sales took a plunge. The decisions Volkswagen made to make the Passat cheaper came back to bite them. For 2016, Volkswagen went back to the drawing board and took a fair amount of customer feedback to help make Passat a better sedan. So, what is Volkswagen doing in the most competitive automotive segment in this country? The truth is that VW has always been there. The Passat served as the brand's entry in the mid-sized family sedan segment even before it was defined. The problem was that it always had a different kind of buyer in mind - more discriminative, preferring premium grade products than mainstream ones and feeding off of European snobbery. Forty years ago, the first Passat arrived in America. Volkswagen of America called it the Dasher. Though not the replacement for the beloved Beetle, it did serve as the company's first front-drive, water-cooled vehicle sold in the States. It began life as a hatchback - in two- or four-doors, eventually sprouting a wagon in the mix. Then, the Quantum arrived - the next generation Passat - by 1979/80 with its first four-door sedan offering. It took VW a bit upscale, but that is if you try to get it closer to the Audi Fox/4000 of the time. The Passat name finally arrived in the form of an aerodynamic family sedan with a slightly higher price tag. It certainly looked the part - premium European aspirations, premium European drivetrains and so forth. However, quality problems dogged its success at the onset of the 1990s. Not exactly what we wanted, but Volkswagen still offered it nonetheless. Throughout the 2000s until the release of the latest Passat, Volkswagen delivered on its premium promise for the Passat. These Passats were good - better, if you ask VW enthusiasts. Though some wondered if VWOA forgot about how they became successful in the first place - competitive, affordable cars. By 2013, the new Passat arrived for our consumption. It was built for us on the European platform, though wider and a bit more accommodating for American families. There were several complaints - all leading to one conclusion: It's not a Toyota Camry, Honda Accord, Nissan Altima, Hyundai Sonata or Ford Fusion. Isn't the point of selling cars is to try to be distinctive in its segment? There is something that VW can distinguish the Passat from others in its segment. It is the only model offering a diesel engine. It is a big deal. Some mid-sized sedans only offer a four-cylinder engine. Others have hybrid electric drivelines. A few have optional V6s - including the Passat. But, VW dares to offer the diesel. Some might say that is the way to go, if you are looking for high fuel economy, long fuel range and ready torque when needed. The TDI is nothing new to the Passat - they offered diesels in America going back to the Dasher. So, we ask whether the diesel makes a difference in this segment. Also, we ask whether the Passat is the right car - offering the diesel as its trump card - to look at in the face of the Camry, Accord, Altima, Sonata, Fusion and so forth. For our review, we not only got a 2015 Volkswagen Passat SEL - we got one with the TDI diesel engine option. 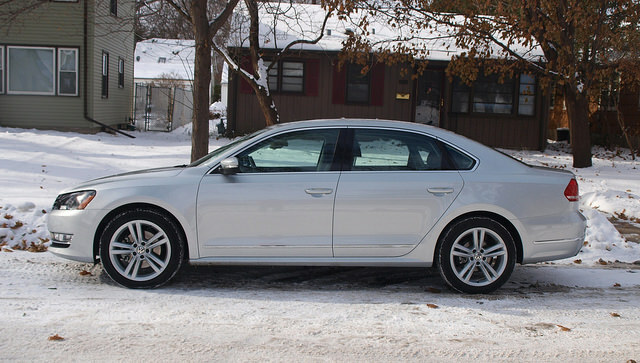 In the cold and snow of Minnesota, we put the Passat TDI to the test - winter blend fuel and all. The 2013 Volkswagen Passat remains a top choice among those looking for a well-refined family sedan. Like most of the Volkswagen line it offers a highly efficient clean diesel option and still maintains the high-quality interior Volkswagen is building its reputation upon. There are only minor tweaks and changes in the 2013 Volkswagen Passat after a redesign for last year's model. The economy and styling of the European segment is grabbing a large foothold in the U.S. market and Volkswagen is leading the way. Since the Passat is the only vehicle in the VW lineup that competes in the "family sedan" segment, its features are geared toward functionality and economy. Volkswagen reliability should put most shoppers over the top when it comes to purchase time.